I read this on Jennifers MySpace, and thought I'd share my answers here. Definitely a bit of pondering! 1. Cigarettes: Not my cup of tea, or stick to light up. 4. Your Last Ex: complete waste of my time. 5. Football: great for commericals. 6. Crack: Not my cup of tea either. 7. Food: Yum - what 'cha cooking? 8. President: so confused. so so many mistakes. so many stupid things said. 10. Car: probably should be filled with gas tommorrow. 13. Fear: Being alone without any resources. 15. Blondes: all in my family. 17. Politics: intrigue me at times - but I get really confused. Why muddle things up so much? 18. One Night Stands: Not my cup of tea. 19. Cell phones: permanantly attached to me. I'm avoiding the crackberry... seriously! 20. Vanilla Ice Cream: OOOH my all time favorite - especially with vanilla beans. 21. Porta potties: gross and disgusting. AND... oh so fun to put onto friends porches in college. 22. High School: nightmare of epic proportions. 23. Pajamas: yoga pants and a camisole - RIGHT on! 24. Wet Socks: gross and totally ICKY! 27. My best friends: know who they are. 28. Heartache: difficult even overwhelming at times. 29. Love: A plenty! As my incredible mother said "There's plenty of love for everyone in this world,"
30. Divorce: amazingly common in our society. 31. Parents: ROCK my world. Seriously - they are SO fabulous. I wish everyone could have a set as awesome as mine. 32. Trees: love lilac trees - the smell is a favorite of mine! 33. Coffee: none - but bring on the Diet Coke. 34. Music: Anything and almost everything. Seriously! I do so love musicals and blue grass though. 35. Soccer: my favorite sport growing up. 36. Pot: should be legalized to avoid the mess. But, it's not my cup of tea. 37. Strippers: do what they have to do to survive. 38. Work: can be fun - can be overwhelming. 39. Babies: LOVE them! We'll see how long it takes for our swimmers to get to the right spot. Ladies... We have a Winner! WOW... you guys are REALLY creative(I'm really not suprised!)! I agree with you that working for Behr and naming paint colors would be a dream job. Seriously! They have some REALLY creative paint names. Sometimes I wonder what they're thinking when they come up with them. I mean, for real... some of them are seriously... strange. It makes me think about what thier hobbies are - and what they spend their down time on. But, hey that's what they get paid the big huge, monsterous bucks for - right? I had hoped to have our door painted in the new color and to be able to share it with this post, but alas - it hasn't stopped raining. Seriously. I have a whole new appreciation for Noah and the Ark. And lemme tell you, they couldn't have released Evan Almighty at a better time - at least for North Texans anyway. This is getting ridiculous. Seriously! Actually, the real name is Ox Tail Blood Red. What kind of color is that and WHAT on earth was going through the persons head when they named it THAT? More importantly, what do they do in thier off time?? GROSSS! So.... Miz. Updycrafts aka Wendy Updegraff ... you are our winner! Please select which book you would like and then email me your mailing address and I'll get your book out to you post haste! Yep! The rumours are correct! The Marshall Creek Road house has sold - closed - done! Whew! YAY! Now I can get back to focusing on the Pine Ridge Road house. And oh what a list of things we have to work on! All new bathrooms, all new flooring, new exterior painting... oh so many new things are happening at this house! So much that we're going to need to find a better name for it rather than "Hell House!". To help celebrate the closing of the MCR house, let's have a contest! Oh yes - let's! Recently two books have tickled my fancy in a wonderful and glorious way! 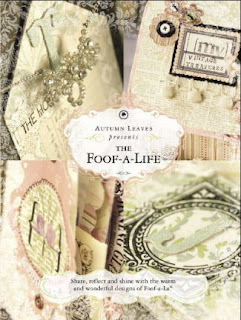 The first is Foof-a-Life by the Autumn Leaves Team. This book is totally and completely inspired by the incredible Teresa McFayden. The second is a book by the lovely Jennifer McGuire titled "101 Things You Can Do With Your Scrapbook Supplies." It's quite a fun book to flip through and get ideas on different ways to use your tools and supplies. We're having our front door painted a fabulous shade of red, however it's name is quite gruesome. Leave me a comment with what you think the official Behr name color is and the person with the paint color name closest to the actual color name wins. The prize is the winners choice between the two books. 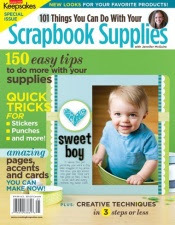 I'll even pick up brand new copies at my favorite scrapping shop, The Scrapbook Pad (I'm not biased - I just work there. But, they really do ROCK) Simple enough? I'll leave the contest open until Sunday evening at 6pm. If you're from North Texas (where I live) you're likely much like me and wondering when on earth all of this rain is going to stop. I'm not a bred Texan (I wasn't born here). In fact, I've been called a "Transplant Texan" by many. Either way, I'm tired of the rain. Normally, Texas doesn't get so much rain. Actually by this time of year the authorities are imposing water restrictions due to severe drought. This year however, not so much. Usually, I love the rain. I love the smell of it. I love how clean everything looks afterwards. I love that it waters my plants and yard (and saves me money by not using the sprinkler system). I love that it cools everything off and normally helps to make life pleasant. However, recently I have learned to not love the rain. It won't go away. In North Texas, we've had more rain this year than in the last 5 years combined. Yes, combined. Talk about some serious rain. We are going to have a huge mosquito problem this year - incredibly huge. I'm never going to leave my house huge (of course that's an over reaction - how would I get to any of my jobs??). Sunday night/Monday morning the town next to mine flooded. Yep, a flood in North Texas. Of course, it was runoff from Perot Properties but still... a flood. I'm uber glad it didn't reach either of our houses (the flood was only about 1/2 mile from the Marshall Creek House). That would have put a huge damper in the house sale - don'tchathink? Seriously - I would have been a basket case. Seriously! It's this Thursday! Wahooo! There are some happy thoughts with the rain though. I haven't washed windows in forever. Love that. I haven't had to water my plants - love that! I haven't washed the car (really Steve-o should do that one anyway), or done any real lawn work. Hopefully the rain will stop. At least long enough for me to go outside to take a nap and turn my lilly white skin into a light cream - or at least something not so translucent. I've also been playing with Martha's goodness. I know I know - many of you are not fans of her mad skillz - but honestly, do you think she did all the designing? I assure you she did not. Her creative team did - and EK Success did more than that. Anywho... i don't care who made it, I love it! I've also been working on my inner "digital diva". I so want to learn how to use this fancy software Thomas hooked me up with. I know a tidge about Photoshop Elements and can get myself around without the use of Mapsco. This new Photoshop CS3 though... it's a whole new world. It's like I'm back in Germany (where I grew up) and I'm trying to speak to the farmer in the farmer market. I know I'm saying the right things, but not in the right dialect. It's a challenge I tell ya - a challenge. Hopefully, you'll soon see a new version of my blog. We'll see... I have lots of ideas on how I want it to look - we'll see how it goes! Off to Silver Bella dreamin! Seriously, there have been some very happy day things happening around here lately. First, the buyer for the Marshall Creek house finally got back to us with the inspectors findings, and her repair requests. The absurdity of some of her requests will be shared on another day, but he accepted the repairs we are willing to do and did not try to haggle with us on the price. YAY! We’re going to close on June 21st at 10am. Happy Day! Seriously!!! Second, Silver Bella ’07 registration came – and I’m going! This is a huge dealio for me. I just knew I wouldn’t be able to go due to the craziness of our impending Pine Ridge house repairs. I was really bummed about it – but the magical glitter flew into a tizzy and it all worked out. I’m going to Silver Bella! Wahooo! (And, I’ve already started my Vitamin C supplements. I will NOT get sick like I did last year – I just won’t!) The Yahoo! Group has started up, and what a big bunch we have this year! It's always fun to get to know my Bella Sisters before the grand event - I'm already counting down the days - 149 sleeps left! Third, not so sure if this is a happy thing yet or not (I’m sure on my resume it’s an incredibly happy thing) I’ve been deemed and ISO Auditor. Yay. Yay? Maybe that should be a YAY! Either way, I get the dubious task of preparing my boss’ teams for our internal audit which will occur in a month or so. Then, I’ll get to audit the other departments who are also going for ISO audits. Another… yay? I’m sure everyone will love it when they see me coming. I’ll have to bring chocolate. Everything is better with chocolate… right? One happy thing about being an ISO auditor is that while I’m in Salt Lake, I’ll be able to visit with my brother Robert and his crew! Hopefully, I’ll also be able to catch up with my Fab-o Aunt Carolyn and Rockin' Uncle Ernest and their brood too. I definitely have to get Darren to do my hair – oh what fun we could have! Fourth, I will be at CHA-Summer this year with the Maya Road team in Chicago. I’m really looking forward to it. Maya Road has been a great company to work with! Their products are fun to work with, easy to design with, are very inspiring, and they keep coming out with fun new products. I really can’t believe my tenure is almost up – it’s amazing how fast 3 years can fly by! 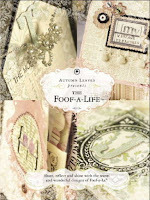 Fifth, the book Foof-a-Life is shipping and should be at The Scrapbook Pad any day now. I have been waiting on pins and needles for this fun book to arrive. I am so stoked to sit and enjoy each page. I am prepared to devour each project and idea with reckless abandon! Sixth, the Pine Ridge house is finally coming together (i.e. 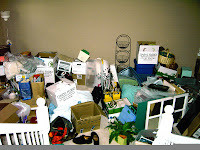 getting unpacked and settled in – not being repaired/demolished... yet). Seriously. This was our house about a month ago. Yes, we had a disastrously dangerous living room. Of course, this photo was taken the same very same day as we moved the “little odds and ends” out of the Marshall Creek house. And, of course, in true man fashion Steve didn’t strategically put anything anywhere. As long as it was into the new house – we called it good. I’ll take photos of the house tonight and will try to share them soon. There are definitely happy things going on – I need to remember to focus on them instead of on the negative. The negative can totally drag me down – and I tend to let it. Such a sad thing really! Bake 30 to 35 minutes or until wooden pick inserted in center comes out clean. Cool 10 minutes; remove from pans to wire racks. Cool completely. Frost with "PERFECTLY CHOCOLATE" CHOCOLATE FROSTING. My friend tipped me off to this recipe a few years ago and it's absolutely my favorite whole wheat recipe. The whole wheat flour gives it this wonderfully chewy consistency and you can't even tell it's made with it. DirectionsPre-heat oven to 375 degrees. Cream butter & sugars in an electric mixer fitted with the paddle attachment. Mix in vanilla & eggs. Combine flours, baking soda & salt. Gradually blend flour mixture into butter mixture. Fold in chocolate chips and drop onto a cookie sheet that has been lined with silpat or that has been greased. Bake 8-10 minutes. Allow cookies to cool for 5 minutes on baking sheets before placing on a wire rack. Try adding in 1 cup of oatmeal and reducing the white flour to 1/2 cup. I have also made this recipe using only wheat flour (substituting the white for the wheat) and it turned out delicious as well. In this tasty and healthy recipe, eggplant slices are dipped in egg and bread crumbs and then baked, instead of fried. The slices are layered with spaghetti sauce, mozzarella and Parmesan cheeses. It’s a LOT like lasagna, but without the pasta or the meat. This meal also freezes VERY well after it’s been assembled. Sweat the eggplant by sprinkling each slice with salt and let it sit for at least 20 minutes in a colander. This will pull out most of the bitterness and the extra water out of the eggplant. Rinse and pat dry. Dip the dried eggplant slices in egg, then in bread crumbs. Place in a single layer on a baking sheet that has been lightly sprayed with oil. Bake in preheated oven for 5 minutes on each side. Reduce heat in oven to 350 degrees F. In a 9x13 inch baking dish spread spaghetti sauce to cover the bottom. Place a layer of eggplant slices in the sauce. Sprinkle with mozzarella and Parmesan cheeses. Repeat with remaining ingredients, ending with the cheeses. Sprinkle basil on top. Try adding sliced mushrooms and fresh garlic to your layers. It’s a great addition! To make this recipe more like lasagna, mix low fat ricotta with the mozzarella and parmesean. Preheat oven to 400 F. Set a rack on a foil-lined baking sheet. Spray the rack generously with cooking spray. Set aside. Put the chicken in a large bowl of ice water. Mix the mayonnaise and mustard in a small bowl. Set both bowls aside. Put remaining ingredients in a pie plate, and combine well. One at a time, remove the chicken breasts from the ice water and pat dry with paper towels. Trim off fat. Between 2 sheets of wax paper, pound the chicken breast with a mallet or rolling pin until it is about 1/3 inch thick. Cut the chicken into strips. Brush the mayonnaise-and-mustard mixture on each piece of chicken until coated thoroughly, then transfer the chicken to the pie plate and bread each piece. Put the chicken on the prepared rack and spray each piece lightly with cooking spray. Repeat process with remaining chicken breasts. Place the baking sheet in the bottom shelf of the oven, and bake for about 40 minutes, or until the coating crisps and browns. Serve with barbecue sauce or another dipping sauce. Makes 5 servings. Wow… what a week it’s been. It’s been fun, crazy, LOUD, fun, loving, stressful, fun, emotional, overwhelming and don’t forget about fun (well for the most part anyway). It was fantastic to have my family here for the weekend. My parents and my sister with her young kiddos were all here to visit, relax and of course, in true Beste fashion… EAT! And oh the food we ate! My mother is THE BEST cook I know and she was in overdrive making us yummy traditional Beste favorites to enjoy all weekend long. Steve was spoiled and expects to have it all the time now – sorry babe, I can’t be my mother. (Though she has taught me many, MANY of my cooking skills). It was great fun having them here and getting to spend time with them. We didn’t do anything spectacular. We did visit the Fort Worth Stockyards and Mom took the kids (‘Rissa and Michael) with Bekki on the Tarantula train. Dad took the kids to see Shrek 3 with Bekki while Mom and I did a bit of shopping at the outlet mall. Other than that, we didn’t do a thing of significance. But, lots of fun was had. I absolutely love and adore my nieces and nephew – and all of their fun individual characteristics. They are really a loving and fun bunch of kids – my sister is an incredible mother. I honestly don’t know how she does it! Each of her children are about 2 years apart – and she has another one on the way! Arissa is active and independent. Michael is determined and sponging up everything around him. Ainsley is adorable and loving – all while refusing to talk (she can talk mind you – she just chooses not to). I can’t wait to see what individual characteristics the fourth baby has. I must be getting old, or perhaps I’m just used to the quietness that is usually around me (except when I’ve got tunes jamming in the house or something). What I’m trying to say is that my house is usually pretty quiet – even when the kids are over, it’s not very loud. I realized this weekend that kids are loud – VERY loud. Of course, as I started getting acclimated to the noise it was time for them to go home. Isn’t that how it always is though? Everyone’s prayers were answered! We have a contract on the Marshall Creek house! YAY! Provided everything goes like we think it will, closing will happen on June 21st! YAY! It couldn’t be at a better time as we have to do more repairs – extensive repairs even - on the Pine Ridge house. We knew we would have to do some repair work, or replace some things – and we were prepared to do it. However, the things we have to do now are not items that were even blips on the radar or on our planned list. Oh the joys of home ownership and purchasing homes. This home is quickly becoming known as “The Hell House”. Our friends often ask us if we’ve seen the movie “The Money Pit” because our stories remind them of the plotline in the movie. Lovely isn’t it? Someday, we’ll be able to look back at our home and at all we went through to make it into what it will (someday) be – and we’ll be happy. However, in the middle of the muck it isn’t so fun.